Feeling a bit horse? 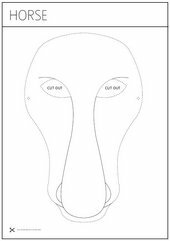 Cut out and colour in the perfect mask for you! George Stubbs was famous for his paintings of animals. This may look like a real scene of horses in a field, but in fact it is a made up picture. Stubbs painted the horses first (some of them are horses he had used in other paintings), and then filled in the imaginary landscape around them. 2 x A4 sheets of 160gsm card (suitable for use in a printer). Download the mask design to your computer. Print out both sheets of the mask design on to 160gsm card. Tip: You could try using different coloured card for the ears and fringe! Colour your mask in with pencils or crayons. 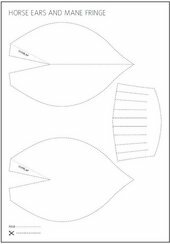 Cut out along the lines marked with a scissor symbol (remember: the dotted lines are fold lines!). Curl the fringe and staple or glue it in place. Fold the ear shapes along the dotted lines, overlap and staple to create a 3D ear. Staple both ears in place. Staple your elastic, ribbon or string to either side of the mask at the points marked with an ‘o’. Now you are ready to wear your mask and giddy-up!